We planned a few days in London for the sole purpose of seeing Dana’s dear friend and New York roommate, Jill, who now lives in London. We realized our budget was in for it when we forked over $32 for two train tickets from Gatwick Airport to Notting Hill. 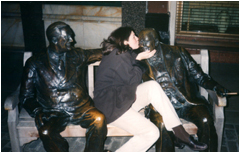 But, just as Jill had been Dana’s personal savior in New York when she found us a rent-controlled apartment, she saved the day again in London when she gave us her Notting Hill studio and went to stay with a friend. (Not before showing us how to work the Murphy bed, which made for hours of fun trying to fold each other up into the wall). 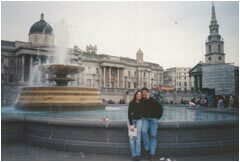 We’d been to London together before, since Will spent many, many months working there in 1997 and 1998. (A little piece of Will will always be in London — a piece of his pelvic bone, that is.) London is so familiar in fact that we forgot we were tourists, and therefore forgot to take any pictures! 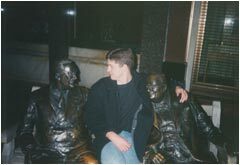 So, the pictures you see here were lifted from the Rousmaniere Archives, circa 1998. Jill did take us to see a few of the sights that weren’t around in 1998, including the new Millennium Bridge, and the London Eye — a huge ferris wheel on the Thames that is now the most visited tourist attraction in London. We also wandered around the new Tate Modern, absorbing some "challenging" modern art (e.g. video of a naked artist hitting himself in the head with boxing gloves, then pouring Heinz Ketchup over his privates). We had a great time hanging out with Jill and her very cool boyfriend Nick. Both work at CNN UK, where Jill is a producer and Nick is the editorial director of CNN.com International. (Don’t ignore that little interstitial pop-up you get when you go to the CNN homepage — it’s your entrée into some outstanding reporting from an international perspective.) Those of you who’ve met Jill know she’s a hoot-and-a-half, so the injection of a new-found streak of British humor left us laughing ‘til we cried. Our abs sore, we picked up our packs and headed for Sweden to enjoy the company of more good friends.